This is the triple alpha process! It’s one of the most important stellar fusion processes. Which is strange, because it’s actually very unlikely to happen. The process overall is called “triple alpha” because essentially you put in three helium nuclei (aka alpha particles) and you get a carbon nucleus out. In reality it is, as always, slightly more complicated. Shown in the images both above and below, the triple alpha process actually consists of two steps. The first step mashes two helium-4 nuclei into a beryllium-8 nucleus. Be-8, however, isn’t very stable. It has an energy very close* to that of two He-4 nuclei, so it tends to just fall apart again. 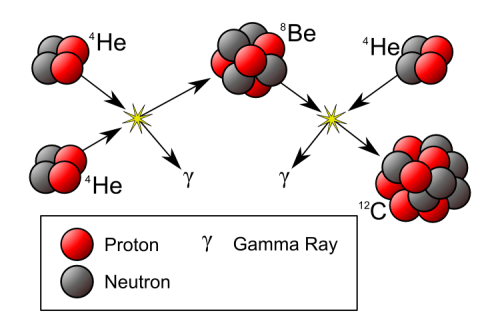 Interestingly though, a Be-8 nucleus and a He-4 nucleus have almost the exact same energy as an excited carbon-12 nucleus does. This means that Be-8 and He-4 combine readily to make carbon’s most stable isotope** (giving a net energy output of 7.367 MeV). The C-12 then just relaxes and goes off to fuse into other elements. This curious combination of events makes the chance of a triple alpha process occurring actually quite slim. Statistically, for just 3 alpha particles it would only happen a couple of times in the lifetime of any star. Thankfully, even the smallest stars contain billions of helium nuclei, so it happens reasonably often. Even so, it tends to take a few billion years for any sizeable amount of carbon to form. 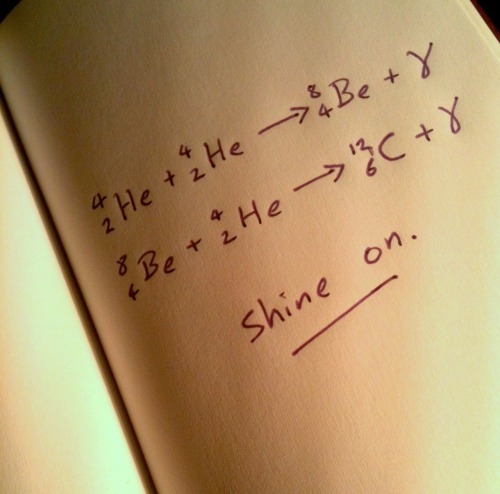 Two things do increase the rate of helium fusion though — temperature and density. The more massive a star is, the hotter and denser its core is, and so the more helium it burns. *Actually Be-8 is 93.7 keV higher in energy than two He-4 nuclei. In physics the lowest energy always wins, so if ever you leave Be-8 to its own devices it rapidly decays into two alpha particles. **Interestingly, this coincidence in energies was predicted by Fred Hoyle before it was observed. Hoyle figured it was the only way to explain how carbon was formed so plentifully. This entry was posted in Imported from Livejournal, physics and tagged astrophysics, stars. Bookmark the permalink. 8 Responses to α α α!